Courtesy of the Corney & Barrow Burgundy 2007 tasting. 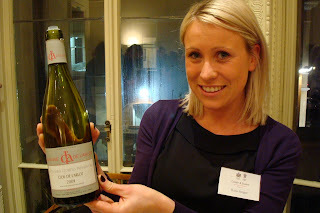 What a nice way to present this Nuits-Saint-Georges blanc - thanks Katie. Whenever I taste a NSG blanc I expect something special. Otherwise why bother switching from pinot in this bastion of pinot wines? This beverage from Domaine de l'Arlot has the personality to merit being blond. Mineral, lemon, attractive, lovely rounded stone fruit. Dry, savoury, finely crafted wine. Merits at least 5 years aging.